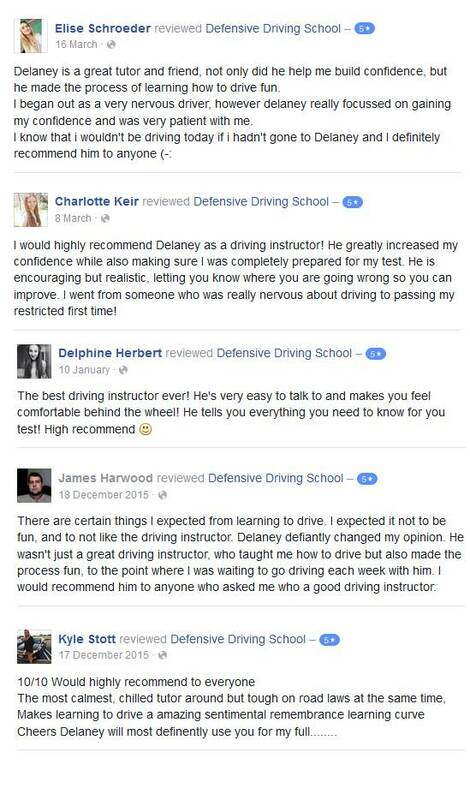 As a Qualified Driving Instructor since 2001, I have been teaching thousands of people for over 15 years. For this year so far the pass rate for Defensive Driving School has been 89% people have passed first time. I believe giving an honest result because writing down that a driving school has a 100% pass rate would be a lie, because some people will naturally freak-out on test, and that’s normal. I will give you the confidence to pass your driving test and minimize your nerves. I value seeing our people passing the driving tests, RESTRICTED and FULL LICENCE. I wont send you to test if I do not believe that you are ready, and that you have a good chance of passing! And I will not take you into heavy traffic on your first drive, unless you can demonstrate that you are confident in that level of traffic. Our Instruction method is Patient, Relaxed and Informative. RESTRICTED and FULL LICENCE lessons? Defensive Driving try to keep our costs to a minimum, saving you money, keeping lesson costs affordable!